The vapor barrier is reinstalled on the door with the wires protruding through a hole near the position the armrest will be once the panels are reinstalled. 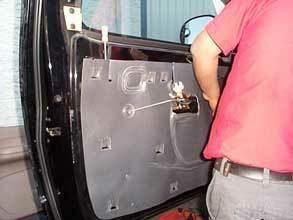 Note that the wiring in the door has been taped together and tie strapped to the door where it will not interfere with the linkage or window mechanism. 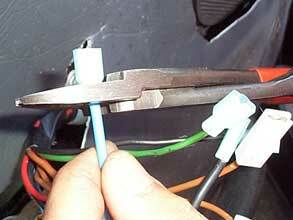 The blue and black wires coming from the motor are also taped to the wiring that will go to the switches. In order to mount these switches in this armrest, the connectors that plug into the switches had to be replaced with shorter ones. We found some terminals at the local auto parts store that were 1/4 inch shorter than the terminals supplied with the Electric Life kit.